Analysis: Is Michael Phelps The Greatest Athlete Ever? A person possessing the natural or acquired traits, such as strength, agility, and endurance, that are necessary for physical exercise or sports, especially those performed in competitive contexts. 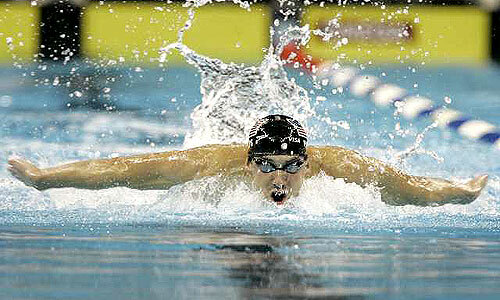 It’s been hovering around him since the opening ceremony, and now after he has shattered six world records and won seven of his seven entered races, there is no question to many sports fans and journalists alike that Michael Phelps is the greatest athlete ever to set foot on Earth. He has the three key components of a true athlete: strength, agility, and endurance, and he happens to compete in a sport that demands each of those traits. But is he really the best? I beg to differ. There is no disputing that Phelps is the greatest swimmer ever, but some people need to seriously contemplate making a statement like this, which in my opinion is very premature. The world has only seen this guy for less than a week, and whatever he has managed to accomplish is admittedly extremely impressive, but the world has simply seen better out of a human being. It seems like in all this excitement the world has forgotten the flawless performances that have been displayed thus far in the world of sports ranging from Kobe Bryant’s 81 point performance, where relentless scoring met grace and agility, to Michael Jordan’s illustrious career. And who can forget Walter Payton’s mesmerizing speed and toughness in the dirty sport of American football and Usain Bolt’s recent world records with arguably the best sprinting ever showcased. And what about Pele, Gordie Howe, Magic Johnson, and the many others who really were sports during their era. And we keep forgetting the unknown sports that really showcase the most challenging and athletic ability — Big Mountain Skiing, Biatholan, the marathon, horse racing, gymnastics, and (my favorite) — parkour. So is Michael Phelps the greatest athlete ever? It’s very hard to tell, and it all comes down to a long and hard thought by a well respected journalist. So who is the greatest athlete ever? David Belle. Look him up. USA Basketball: Is This Their Year? In past years, USA basketball has come into big competitions with high expectations, and after “shockingly” being beaten by teams that trained together the entire year for these moments, one might wonder if they are destined to lose unless they play with a team’s mentality. Can this country, blessed with the most talented basketball players the world has to offer, ever assemble a group of ball-players to compare with Jordan’s historic 1992 Barcelona squad? Is this Coach K’s year to make a gold medal team? Can America put aside its troubles and rivalries, and instead of playing for themselves, play for the world? Is this their year? All signs point yes, but what do I think? No. And I’ll tell you why. In today’s basketball, more and more of our best players are assembling overseas, and less are developing in America. Our young american players grow up under a coach’s eye, each and every one of them with tremendous talent, but most totally uncoachable. And this is the exact opposite over in Europe, with great, coachable team player being mass produced like Toyota Prius’s. So unless America can get it together NOW and play for the common prize, a gold medal (which I don’t think is going to happen this year), our future looks dim. In contrast, the 1992 team consisting of the NBA’s legends who united once a year to play together as one, were much like Europe’s players today, but much more talented. Led by Michael Jordan, Larry Bird, and Charles Barkley, that team had depth too, their entire bench hand-picked from the nba’s greatest role players. Jordan, among his teammates, sacrificed points for assists (he rarely posted over 18 points in a game), and the team excelled more than any USA team could wish to do today (or ever again). My point is, unless the US can take away their star power and ego, we’re not going anywhere in the olympics. Do I think we can do it this year? Yes. Will we do it this year? No. For this year’s summer olympics, everyone involved from doctors to the athletes themselves have voiced their concern about Beijing’s air quality, especially for more intense and breath-demanding outdoor sports like sprinting and long distance running. Doctors are even predicting that the air quality, along with Beijing’s summer heat and high humidity, will require more hydration and breaks for the athletes if they want to stay conscious and come home to the US without any health problems. The air, which Time dubbed “the worst in the world” will force US athletes to wear protective masks even when they are walking around town. The internet is abuzz with criticism toward the pollution. One person I noticed over the web had a rather interesting observation, reminiscent of Sharon Stone’s controversial comment which got her banned from China all together. They claimed that it was “karma” that China is stuck with horrible humidity and pollution after all the “mistakes” they made. Figures. But there is hope! Time.com published an article titled “Beijing’s Olympic War On Smog,” which cleared up any uncertainty to me, stating Beijing cut their total emissions by 30%. One former steel worker claimed that after the factory he worked at was shut down, the air is “so, so much better.” Well, at least they have a start.